The concept of a subtle energy, or qi, appears to be universal. It is regarded as the primordial life force itself, and is given different names by different cultures (qi in China, prana in India, ankh in ancient Egypt, arunquiltha by the Australian Aborigine, mana in Polynesia, pneuma in ancient Greece, tane in Hawaii, orenda by the Iroquois, ki in Japan, etc.). In the west, one finds, "many published reports of experiments in which persons were able to influence a variety of cellular and other biological systems through mental means. The target for these investigations have included bacteria, yeast, fungi, mobile algae, plants, protozoa, larvae, insects, chicks, mice, rats, gerbils, cats, dogs, and well as cellular preparations (blood cells, neurons, cancer cells) and enzyme activities. In human 'target persons,' eye movements, muscular movements, electrodermal activity [electrical characteristics of the skin], plethysmographic activity [changes in volume of a body organ or of the whole body], respiration and brain rhythms have been affected through direct mental influence." However, western science can't precisely say what subtle energies are, can't specify the mechanism of subtle energies, can't credit a given therapeutic result to subtle energies with certainty, and can't say who is a legitimate subtle energy practitioner. This image shows the galaxy cluster Abell 1689. 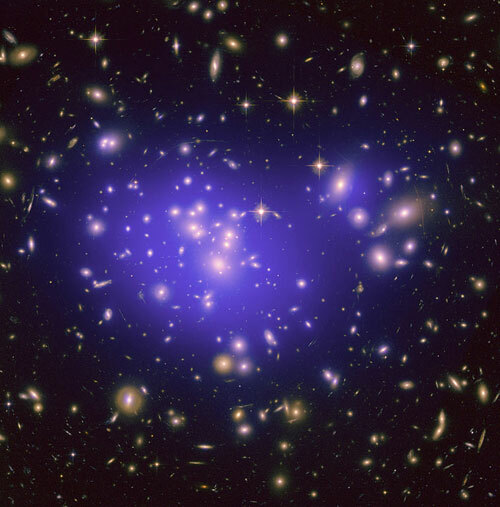 The mass distribution of the Dark Matter is shown in purple. Source: Wikipedia Commons. A Map of Dark Matter in the Universe. Dark matter, normally invisible, is here rendered in pink. The image covers an area of the sky about 400 times the size of the full moon. The image was made by analyzing light from over 2.5 million distant galaxies more than 6 billion light-years away. Credit: Kilo-Degree Survey Collaboration/H. Hildebrandt & B. Giblin/ESO. Source: "Dark matter map of KiDS survey region (region G12)." For more about this image go to the video, "Dark Matter Map Made From Huge Galaxy Survey." Subtle energy, or qi has both local and nonlocal effects and is associated with prevention of disease, healing, the martial arts, as well as spiritual growth. In esoteric Daoism, circulation of qi along pathways inside the "body" is capable of producing improvements in health and life, and there are many methods of circulating qi, from acupuncture/acupressure, to specialized movements (qigong), to meditation. Through Daoist meditation techniques one can attract external qi in through the chakras. In Kriya Yoga, prana can be developed through asanas (postures), mudras (gestures), mantras (seed-sound syllables), and band has (muscular contractions). Qi or prana has properties that are not explainable in terms of physical matter as we know it. Although some have suggested that qi is a form of electromagnetic energy, it would have been all too easily detectable if this were so. Furthermore, it would require an entire electromagnetic information transmitting system, and a complete information receiving and interpreting system, which living systems do not seem to have. Traditionally, prana is associated with the subtle body called the prana-maya-kosa. The failure of the west to verify such a subtle body has led to alternative models about qi or prana. But with the understanding that "dark matter" (pranic matter) makes up the prana-maya-kosa, it would appear that qi or prana is simply a form of "dark matter" and/or the energy transmitted by "dark matter," which is why it has been so difficult to establish a physical basis. [For more of the author's comments on Dark Matter click here: https://www.esolibris.com ]. Direct interactions between subtle bodies composed of pranic matter is quite possible, and skilled practitioners of qi or prana have perfected techniques which enable them to transmit this energy externally. Qi can also affect the subtle bodies by entering through the chakras and transmitted through the body by the nadis [qi vessels and channels, also called "meridians"]. We should also mention that qi and prana are discussed in various ways, and so although one normally is referring to the "dark matter" and/or the energy transmitted by this "pranic" matter, some references to finer forms of qi may be in regard to the finer forms of "dark matter" such as mano matter [i.e., composed of mind] or vijnana matter [i.e., composed of wisdom] and/or the energy transmitted by them. There is a large body of research which has been performed that supports both local and nonlocal energy based alternative therapies, such as the power of prayer, spiritual and psychic healing, hands on healing techniques (biofield), and oriental medicine…. The very ancient alternative therapy is Traditional Oriental Medicine, [and]... the basic feature of this therapy is the qi (or prana). This concept has already been discussed. Qi energy can effect the subtle bodies through the meridians or the chakras. The visible physical body can in turn be easily affected. This "dark matter" subtle body explanation for qi can also implement a basis for essentially all biofield therapies and therefore provides and satisfies the desired scientific basis. Copyright© 1997 Deno Kazanis, Ph.D. All Rights Reserved. ^ Mookerjee, A. Kundalini. Rochester, VT: Destiny Books, 1991: 9.